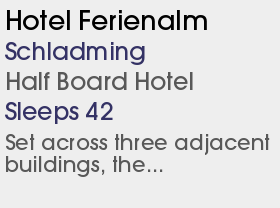 4 Half Board Hotels and 1 Bed & Breakfast. 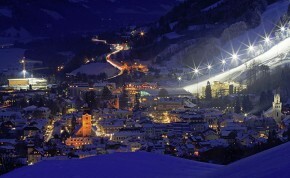 Schladming’s slogan is 'Gemütlichkeit - The Magic of the Mountains'. In Austrian, Gemütlichkeit means coziness, which perfectly describes this tiny mountain village nestled in Austria’s Schladmin-Ramsau/Dachstein sports region of the Enns Valley. 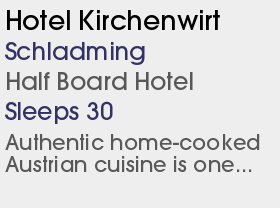 A large, classic Austrian, bustling village, Schladming dates back to Medieval times and has tremendous character. The pedestrianised centre of Schladming dates from 1322 and is a sheer delight. The ancient streets twinkle with fairy lights and are lined with cafés and bars. It's also a real town with wood yard, railway station and brewery with adjacent pub. 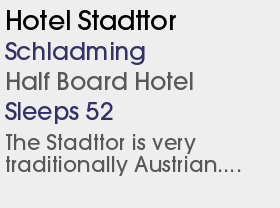 The most popular skiing is based around the four mountains closest to Schladming. These genuinely cater for all levels and abilities, from the novices on the nursery slopes of the Hochwurzen, through the intermediate on the tree lined pistes of Planai and Reiteralm, to the advanced mogul and powder bashers on the Hauser Kaibling mountain. There is also extensive skiing across the valley in the Ramsau region, which also provides easy access for the Dachstein Glacier and extensive cross-country skiing. Add half a dozen half-pipes and dedicated areas for the adventurous boarders and 5 other mountains to choose from little wonder Schladming is the ski paradise region! The excellent Schladming ski school meets at Rohrmoos and the Planai nursery areas are extremely well-ordered with several gentle blues. The lower slopes of Rohrmoos are equally suitable for novices. 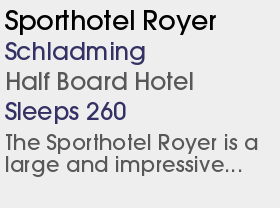 There is a lively and cosmopolitan apres ski atmosphere with a wide variety of bars and discos. 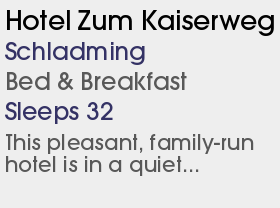 The vibrant nightlife makes Schladming a popular choice for those looking for a lively time but the bars and cafes become pleasantly busy rather than raucous. There's everything from modern music to relaxing, traditional beer cellars and tea dancing. A new funslope is to be oened to the public on Hochwurzen. New après-ski bars are being constructed at the Haus and Reiteralm lift bases. The old Burgstallalmbahn quad chair at the top of Planai is to be replaced by an eight-seater chair lift with a significant improvement in capacity and an astonishing top speed.